This is What Plutocracy Looks Like! Friedman then counterbalances Gilding’s take with the views of John Hagel III who argues that the new opportunities of the global economy have resulted in “a huge global flow of ideas, innovations, new collaborative possibilities and new market opportunities. This flow is constantly getting richer and faster. Today, they argue, tapping the global flow becomes the key to productivity, growth and prosperity. But to tap this flow effectively, every country, company and individual needs to be constantly growing their talents.” He then predictably concludes that his “heart is with Hagel” and his “opportunity-based” narrative rather than the “threat-based” narrative of Gilding but he thinks we ignore Gilding’s points at our peril. If there is a core theme to the Occupy Wall Street movement, it is that the virtuous 99 percent of society is being cheated by the richest and greediest 1 percent. This is a theme that allows the people in the 99 percent to think very highly of themselves. All their problems are caused by the nefarious elite. Unfortunately, almost no problem can be productively conceived in this way. A group that divides the world between the pure 99 percent and the evil 1 percent will have nothing to say about education reform, Medicare reform, tax reform, wage stagnation or polarization. They will have nothing to say about the way Americans have overconsumed and overborrowed. These are problems that implicate a much broader swath of society than the top 1 percent. Brooks follows this up by knocking down the strawman argument that taxing or taking the wealth of the top 1% would eliminate the federal deficit as if that was the key point of the entire protest. His answer is to look toward the “boring” folks proposing real policy solutions that make use of “market forces.” It’s the insiders like Sam Nunn, Pete Domenici, and former Clinton staffer Matt Miller who are the real visionaries, not the “milquetoast radicals” occupying Wall Street. What is interesting about this discussion in the Times is that: 1) these elite columnists think it’s necessary to opine on the subject of the occupation; and 2) that the usual apologists for neoliberal globalization and corporate hegemony are both struggling to find a way to avoid basic facts just as their colleague Krugman suggests. This makes for some interesting ideological maneuvers. The Brooks strategy is to pooh-pooh the very notion of an elite altogether as a simplistic fantasy, a facile oversimplification by the simple-minded rabble on the streets. Clearly only these conspiracy nuts who don’t read his columns regularly enough to know that Pete Domenici is out there fighting for us are a silly bunch indeed. By obfuscating the very real existence of the American and global elite, Friedman and Brooks do what they always do and what much of what constitutes American mainstream political and economic discourse always does: fail to give Americans an accurate cognitive map of political and economic power. This is crucially important because if people don’t have the tools to clearly understand the nature of power, they don’t know how to contest it and frequently place blame for our country’s problems in the wrong places. But let’s hope that Occupy America is a sign that, despite the obstacle of a corporately owned media system, people are beginning to wake up. While recent discussions of the “Buffet rule” have focused people’s attention on the fact that the rich have gotten richer while the rest of us have suffered, they have also exposed the truth that, as opposed to the decade’s old mantra of the anti-tax zealots, the affluent pay a smaller percentage of their income in taxes than the rest of us. The rich have gained, the poor are poorer, and the middle class is shrinking. You don’t have to have a Nobel Prize in economics to know that this is not fair. What this phenomenon has done is push us further towards plutocracy or the rule of the dollar. And for those out there who think this is a conspiracy, all one need do is check out the activities of American Legislative Exchange Council, or ALEC. ALEC is not a lobby; it is not a front group. It is much more powerful than that. Through ALEC, behind closed doors, corporations hand state legislators the changes to the law they desire that directly benefit their bottom line. Along with legislators, corporations have membership in ALEC. Corporations sit on all nine ALEC task forces and vote with legislators to approve “model” bills. They have their own corporate governing board which meets jointly with the legislative board. 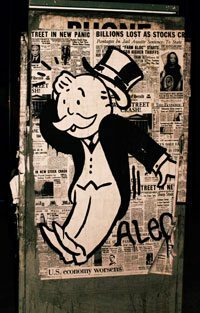 (ALEC says that corporations do not vote on the board.) Corporations fund almost all of ALEC’s operations. Participating legislators, overwhelmingly conservative Republicans, then bring those proposals home and introduce them in statehouses across the land as their own brilliant ideas and important public policy innovations—without disclosing that corporations crafted and voted on the bills. ALEC boasts that it has over 1,000 of these bills introduced by legislative members every year, with one in every five of them enacted into law. ALEC describes itself as a “unique,” “unparalleled” and “unmatched” organization. We agree. It is as if a state legislature had been reconstituted, yet corporations had pushed the people out the door. More specifically ALEC (which is 98% corporate funded) pushes a corporate agenda at the international, national, state, and local levels with regard to union busting, workers’ rights, the privatization of education, healthcare, the environment, energy, agriculture, voting, taxes, prisons, immigration, and much more. It is not a conspiracy of the imaginary “nefarious elite” as David Brooks puts it; it is how the very real economic elites have high-jacked our government at every level. It’s how the Koch brothers’ money talks and democracy walks. To put it another way, this is what plutocracy looks like. To review ALEC’s activities on a state by state level, see where their money comes from and which politicians are part of the organization, see: www.alecexposed.org. I ran into a group of friends at the Saturday Occupy rally and commented that we are experiencing a disorientating tale of two cities. I stood amidst the aggrieved 99% and not too far away is the site of our own home grown plutocracy in action- the proposed stadium in Petco park and an expanded convention center. One friend remarked that these projects are being presented as if they are of course going to go forward and that our mayor is just working out the details with the interested parties. Both of these ill advised and ill begotten projects are predicated upon the long arm of the wealthy grabbing an enormous amount of cash out of the public till. This is what plutocracy looks like- San Diego style. Thanks Jim for a great article. Excellent example. The City seems obsessed with pleasing its handful of millionaires and with foolish projects like a showpiece downtown library. You going to drive all the way downtown to go to the library? Unlikely. But, jeez, Frisco has a nice new downtown library and now our elite want one, too. And a downtown ballpark. N0, TWO downtown ballparks… etc, etc. Gordon- one of the most pernicious aspects of our homegrown politics is the blurring of the public-private distinction. Using the example of the downtown library however, as another example of public tax giveaways to private entities is erroneous. We expect our taxes to pay for libraries, both downtown and in our neighborhoods. We expect our taxes to pay for recreational spaces and centers. Our tax dollars should not be used to bankroll wealthy sports teams or expand the convention center. Those are not our civic functions. You can argue whether this is the time to build a new main library or a new city hall to replace the current one. But those are legitimate uses of our tax dollars. I don’t think this is a fine distinction- it is a critical, significant distinction. Nice article, and great to see it calling the problem what it is: corporatism leading to plutocracy. Neither of which is capitalism. Posted in the Miami Herald today (ref. below) is my list of critical, addressable issues. 1)I like your mortgage idea better than mine i.e. 1% is better than 4% and 1% is the rate at which funds move from the Federal Reserve to banks….very good!…but you will need a method to pay for defaults i.e. this needs to be a zero cost foreclosure solution or the ‘moral hazard’ argument will win. 2)I did not see any mention of Education….ref. my first item below. 3)The unemployment situation needs to be addressed ASAP and concurrently we need to move away from representation (and lobbyists) to direct voting. We have the technology and there is no need to use the democratic method of centuries past. important objectives that the U.S.
American Dream and to restore the U.S.
re-found salaries (stimulatively) into the economy! hands, and then (stimulatively and) directly into the economy. The Cost for the program is $0…to secure a mortgage is free. To pay for those still defaulting the 10% fees will cover it. does…lack of consumer discretionary funds does….simply. Every citizen votes directly via computers, telephones, etc. using a PIN; and your SS number. Employ continuous security/hacking resistance and testing/sampling by using Anonymous. jobs and it will be the lobbyists out of work….all 700,000+ of them. Your three part plan will never work. Our great nation has never see capitalism, and instead, pretends that capitalism is at the heart of our national problems. The real problem is the people running the Government. This Government has gotten too big, and has regulated too much. Get rid of the Federal Reserve, go back to a gold standard, and remove the collectivist from Government. Try true capitalism for the first time in America, and have some personal accountability. Instead of regulating bushinesses seen as bad, take some personal initiative and boycott the corporations that do not care about the consumers. THE ONLY WAY THE GOVERNMENT CAN HELP, IS IF WE DEMAND THAT IT “GETS OUT OF THE WAY”. If you don’t believe me, just wait, and you will see! THE ONLY WAY THE GOVERNMENT CAN HELP, IS IF WE ARE the GOVERNMENY…..DIRECTLY! As for regulations, we just spent all 8 years of Bush’s so-called presidency in deregulation heaven and it hasn’t stopped yet. But I’m funny about things. When I’m in a plane I hope someone is regulating the airline industry so the plane doesn’t fall out of the sky. I hope the water I drink won’t be so full of pollutants I’ll die of cancer. I hope the drugs I take were scientifically tested by UNBIASED scientists rather than corporate hacks. Regulations are NOT what is keeping Corporations from employing people. Who benefits from “smaller government” and deregulation. The corporations and the ultra-rich. As always, follow the money. The Tea Party is a wholly owned subsidiary of the Koch Brothers, corporate oil and coal barons. Why wouldn’t they want deregulation? If there were better mining, workplace safety and environmental regulations they might have to pay workmen’s comp claims or pay restitution when they destroy people’s lives or pollute their drinking water, etc. As for getting rid of the Fed, Rep. Dennis Kucinich has a new Bill: The NEED Act (National Emergency Employment Defense Act.) It would end the fiscal crisis and create millions of jobs by putting the Fed into the Dept. of the Treasury. Our Constitutional Federated Democratic Republic has been hijacked -a hostile take over- by corporations -they are making the laws and setting the national agenda and are hostile to social programs..-they are anti-social-. We live in America’s Hideous Epoch -the rise of the sociopaths. These are the goals of OWS (copy paste into your browser if required). “We are a group of college students and pro bono lawyers who met when the students got arrested in NYC. Since then, we have established an Occupy Wall Street “Working Group” to prepare a proposal to elect an Executive Committee for the purpose of organizing an election of a National General Assembly to vote on a formal petition of grievances. This is only a proposal and sample list of just demands on the government. Only a duly elected body can legitimize a list of demands from the People. It appears that this idea has not gone through the General Assembly process of the Occupiers in Liberty Park. And it is an intriguing idea which may generate discussion at OWS sites throughout the country. If U.S. History had another name it might be “Play it again, Uncle Sam”. The system is not broken however. The people in charge, or who have elevated themselves to be in charge of this system are what’s broken. In fact, it is in tatters beyond repair. The heart of man (Men and Women) has not changed in the realm of wealth. More is better. Sometimes more is not enough. Greed is not good. Greed has destroyed having any faith in America. Hope has gone on a long vacation and the King needs something to do. Our congress and senate make up a body of government which is no different than a monarch. It is only declared terminologies that makes it appear to be rule by law. (Democracy). That runs through the entire financial system as well. We are all part of the financial system if we each have a job of some kind. Even a criminal who steals for his livelihood is part of the system. If there were a culture of moral financial conduct in the halls of congress and on Wall St… oh yeah, wait a minute, I am dreaming again. I have to get back to work to save for my retirement. The King would never listen anyway. Here in America we are now living in a CORPOCRACY. Damn dude, you can actually write. Well done. if it was just the wealthy running the country that would be one thing, but those running this country are more than wealthy… they are malevolent, arrogant, supremely selfish, and worse anti-social as in the human pathology known as sociopathy. One out of 30 people are natural born “genetic” sociopaths… these folks for their entire life are unable to form a fully functional humane conscience.. their behavior gives them away. Watch for this.. unconscionable tactics to accomplish unconscionable agenda. It would be excellent if natural born sociopaths were not allowed to serve in government…. I have given this subject a lot of thought… first we do not want a sociopathic solution to the sociopath problem.. but -you need to think about this for a while… psychotics can not buy guns,,, their rights are limited! We need the same thing for the anti-social personality disorder -those unable to form a fully functioning conscience can not hold government office… and a lot of other limits. Ref. the 90%+ of public office holder were (or are) Lawyers….nuff said! Eliminate them and all lobbyists by being the (direct) democracy we are labeled. Put an end to the representative in “representative democracy”. Paul Krugman is a Gate Keeper for the 0.01% (this number might be too large number) plutocrats. Debt based money (money lent into existence, aka, Federal Reserve NOTES) can never be paid back by society – they are system of debt SERVITUDE BY DESIGN. Bailouts give dollars to Big Finance Capital plutocrat international interests and leave society with the debt to pay even though they received none of the money to be able to pay it back. Krugman and his ilk cover for this debt-dollar tyranny and the Big Finance Capital Tyrants who created, operate and benefit from this societal asset stripping operation. Of course, they have the best “sheep suits” all your stolen money can buy. Out of curiosity, how does the success of the 1% prevent success of the 99%? Why do you care so much about the 1%? You are obviously not one of them. The 1% have made their wealth off the rest of us – the 99%. It’s not about caring so much about the 1%. Rather, it’s a simple question that really hasn’t been answered around here. The question was answered. The monetary system is a fraud that systematically asset strips society. Those being systematically asset stripped are being looted. The vast majority of the top 1% have no idea how the system operates, they are just very successful within the system. So it isn't that most a ripping everyone else off, it is that the system they work under rips almost everyone off. Many of the top 1% will be wiped out in time – they just think they are "players." Thanks for clearing that up. That was terrific. It sounds as though the only correct answer is to abolish the stock market, since public companies are driven by profit, and to abolish private enterprise above a certain size as the larger they become, the more money they make, thus exploiting the workers even more. Ironic that the larger the company grows, the more money the 99% will make. Is the answer then to have government run our industries? Or should everyone work in a small privately owned business that can afford to pay employees only the minimum wage because of narrow profits? Let’s clear up a few misconceptions you have in your head..
1. The monetary system IS NOT the stock market. 2. The monetary system IS NOT private enterprise (well, it is, but so was Al Capone’s line of work – and they are both criminal enterprises – although you are to uninformed to realize this and too uninterested to learn about it based on your Straw Man logical fallacy response). 3. You mean the 99% in China? Tax free offshoring was wonderful for American’s right? 9 million American manufacturing jobs sent over seas to slave labor camps and pollution factories is wonderful and “free!” Yaaaaay! 4. The government is responsible for the fraudulent monetary system, why would we give them even more power TO RIP US OFF (you believed the media lies, didn’t you? You haven’t figured out the media is fake yet? Oh, you will…)? 5. Another straw man? America was at its best when the local businesses thrived. One worker could support the average family. Stockholm Syndrome – isn’t great when you don’t even know you have it? Oh, you do – that’s why you had no idea where I was coming from. Or that the system is robbing you, too. I’d also like to clear up my typos, bizarre grammar… -lol- Sorry about that. But the message is still clear… so after you attack the typos and grammar (again avoiding the real issues here…), how about focusing on the message? But let's make it a little more real. The 1% isn't really the problem, it is more like the top 300 families or so that prop up the debt based monetary systems. The debt dollars flow from the top down (lenders to debtors) and the resources flow from the bottom up (interest collected in order to have a money supply). Debt grows exponentially compared to the money available to pay for it. Borrow $1.00 into existence, $1.03 is owed after a year (at 3%). The debt is impossible to pay off. The borrower is foreclosed upon and his assets seized – through the mechanization of a fraudulent monetary system. Debt will grow parabolic to money available to pay it off until the nation is taken bankrupt. There is no fix – it is designed to bankrupt America to benefit the very, very, very few – less than 1% of the 1%. Plutocrats for Education or Education for Plutocracy? - Community College News Now! Newer Article: Do you support Occupy San Diego? Then get on the phone right now and call the Mayor and Council – get them to pull the police off our backs!